Representing the next generation in SCBA, the Propak is a single cylinder set offering exceptional levels of comfort, performance and reliability. High Performance Pneumatics. CE marked to EN137:2006 Class II incorporating the stringent flame engulfment test. 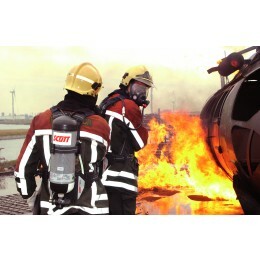 Single cylinder use comprising lightweight , anti-static composite backplate with Kevlar cylinder band and fully adjustable padded body harness. Fitted with shoulder mounted pressure gauge with a 55 bar warning whistle.